I’m not trying to be self-congratulatory by saying this but, I’ve been vegan for quite a while. Long enough at least to remember when powdered soymilk was a viable non-dairy milk option; when the only tofu I knew was sold in aquarium sized buckets of murky water at the local Asian market and the few vegan zine recipes I had in my arsenal did it no justice. So, I think for that reason, I hated tofu in those early days. When I ate it at restaurants, I was rarely impressed – not because I had a distinguished palette mind you, but more so because I didn’t. I didn’t understand tofu. And it didn’t understand me. Our relationship had all the makings of a bad sitcom! Oh Tofu! So, to me, this tofu recipe is akin to Michael Jackson’s Thriller Album. It’s got all the makings of a hit. If, like me, you’re not the biggest fan of tofu then this will in the very least have you moonwalking your way to a nutritious breakfast staple. 1. Break up (drained) tofu with your hands (in smallish pieces) into a medium sized bowl. 2. Add the rest of your ingredients to the tofu. 3. Using a rubber spatula incorporate all of the ingredients thoroughly. 4. Taste your tofu. Adjust your salt level. At this point your tofu as is should taste good. Salt to taste – If you need your adjust your seasonings to your liking this is when you should do it. 5. Heat Canola Oil in a skillet or rimmed pan. Add your tofu and cook until heated throughout. This is when you decide how you want your tofu. For a harder ‘scramble’ allow tofu mixture to cook longer and brown evenly. For a softer scramble – heat throughout and eat! * At this point I’ve eaten tofu scramble all over the world and I can safely say this is the best. If you disagree with me then the terrorists have won. So. There. I’m kidding people! ** Tofu has yet to put out an album of music. It is strictly inferred. I found this recipe on Pinterest and I just made it. 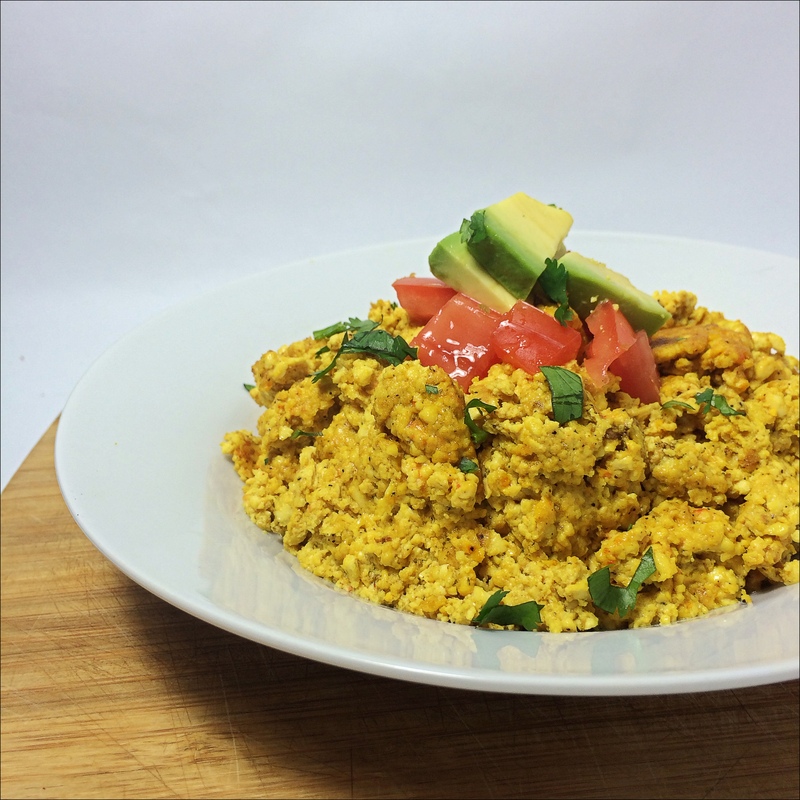 It was the first time I ever tried tofu scramble and OMG I love it! I only cooked about 1/2 of it and put the rest away for tomorrow (or dinner tonight). I served it with sliced avo and coconut bacon. Thanks for sharing this – I’ll definitely be making it again! Thank you so much for trying the recipe! I’m glad you enjoyed. Truth be told, it’s my fave too and I make it all the time. Ha! woo! Just bought some vegan mayo and I’m ready to give this a shot! I think I’ll add fajita veggies and cilantro to it.. maybe breakfast burritos? P.S extra credit goes to you for your uses of GIFS. Wow! I’ve been following you on instagram and I’ve always been impressed by the dishes you make. I thought your recipes must be so complicated and take a lot of time to make. I finally tried to make your tofuevos, and they were easy and EXCELLENT! Thank you! Thank you so much for checking out the blog and trying the recipe! I just made this tonight for my omni boyfriend, and he said it has now become one of his favorite meals! I added onion, garlic, red bell pepper, and mushrooms. Delicious! Thank you for this recipe! That’s great! Thank you so much for trying the recipe. As with any of my recipes – they’re just a base. Way to get creative and add your own spin!